You know that you love her, and you know that she loves you. You think that she is perfect for you and you want to show her just exactly how you feel about her, by giving her that beautiful diamond ring and asking her to marry you. But, before you do, you have to find that perfect ring that says just how you feel. So, you have gone out and searched through the shops, you have spent many nights searching around the Internet, and you know what you want… but you just can’t find it. Now what? Well, you find a shop that will help you create the perfect custom ring to show your love. Finding a shop that will help you create a custom ring isn’t that hard. You should be able to look through your local phone book, or the yellow pages online, to find local jewelry stores that do custom rings. Some will offer you the full line of customization, from the design of the ring setting to the shape and size of the diamond itself. Others will only offer you a selection of different diamonds and settings that are pre-made. So, all you will need to do is to go in and view their selection to see if they have what you are looking for. When you are looking for these shops that do custom rings, you need to make sure that you know all about the pricing for their services and what you can expect to pay for your custom ring, should you order it through them. There are sites on the internet where you can design your engagement ring virtually. You can choose the type of metal, the style of ring, the diamond setting, and the shape and size of the diamond itself and put it all together to see how it will look before you order it. These are a great tool if you aren’t sure what kind of ring, setting, or diamond that you want. Plus, most of these sites will allow you to print out the finished design and take it to your local jewelry store to have them create it for you. Some of these sites will also offer you the option of ordering the ring you have created online, so it will come fully customized and ready to wear. But, be sure that you check the prices on this first, as you can usually get it cheaper if you take your design to a store in town. Some of the larger chain jewelry stores will have a ring designer on staff. So, if you just cannot make up your mind on what to do, take your fiancee into the shop and have her pick out several different rings that she likes. Then, you can show the ring designed which ones she picked, and they can help you design a special ring that will combine what she liked about those rings into a unique one, made just for her finger. No matter how you customize her ring, knowing that you took the time to sit down and fully design a special ring just for her will shop her exactly how you feel about her. This ring will not only be one that she will wear for the rest of her life, but it will show her just how special she is and how much she means to you as well. At Tejani Bridal Jewelry, we are committed to providing you with high quality jewelry at a price that you can afford. 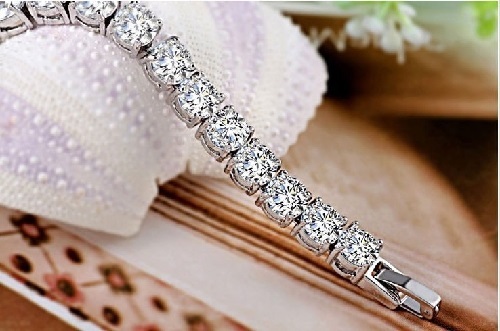 We have a wide selection of man made diamond earrings, pendants, necklaces, and we are sure that you will find one that you will fall in love with. Search the rest of our site to learn more about our man made diamonds and how you can purchase one today.